The AR platform dominates the rifle market today and with good reason. The options for customizing your AR are endless. Changing the caliber of your rifle to another mid-range cartridge, like the impressive 6.8 SPC, usually requires changing only the barrel and bolt. Alternatively, you can build your 6.8 SPC upper from the ground up. This gives you the chance to exercise some gunsmithing skills and come away with exactly the rifle you want. Here, we review two great stripped-down uppers for your 6.8 SPC build. Barrels, bolt carrier groups, and charging handles are not included. The 6.8 SPC was developed at the beginning of the twenty-first century by Remington Arms and the US Army Marksmanship Unit. It was meant as a potential upgrade to the 5.56x45mm NATO. Although the 6.8 SPC does exhibit outstanding performance, the military has yet to settle on a replacement for the 5.56mm. Using experience gained from the Iraq War, the 6.8 was designed for improved performance in urban combat with a short-barreled carbine. The 6.8 is a compromise between the unsurpassed external ballistics of the 6.5mm and the excellent terminal ballistics of the 7mm. What this boils down to is that the 6.8 provides stopping power somewhere between the 5.56 and the venerable 7.62 NATO. It does this while remaining compatible with standard AR-15 lowers (think mag wells) logistics are only slightly impacted, with a 25 round, 6.8mm magazine being the same size as a 30 round 5.56mm one. Another plus is that the 6.8 ammo is pretty affordable and widely available. It was not as affected by the 2013 ammo shortage as the current and former US military rounds which are popular with the tactical crowd. It is also very easy to develop sub-MOA 6.8 rounds by handloading for your rifle's unique barrel harmonics. The best 6.8 SPC uppers will fit any mil-spec AR-15 lower with zero problems. Besides that, here are a few features to look out for on a stripped-down upper and a few of the choices of great uppers. First, decide whether you're going full-featured or lightweight. We all have ideas about the intended purpose of our prospective firearm. From hunting to plinking to competition, these ideas often don't pan out. Maybe we don't get around to realizing some use case, or, once in hand, we hit on brand new ideas of what to do with our weapon. Perhaps it's best to stick to a general, flexible design philosophy and take it from there. 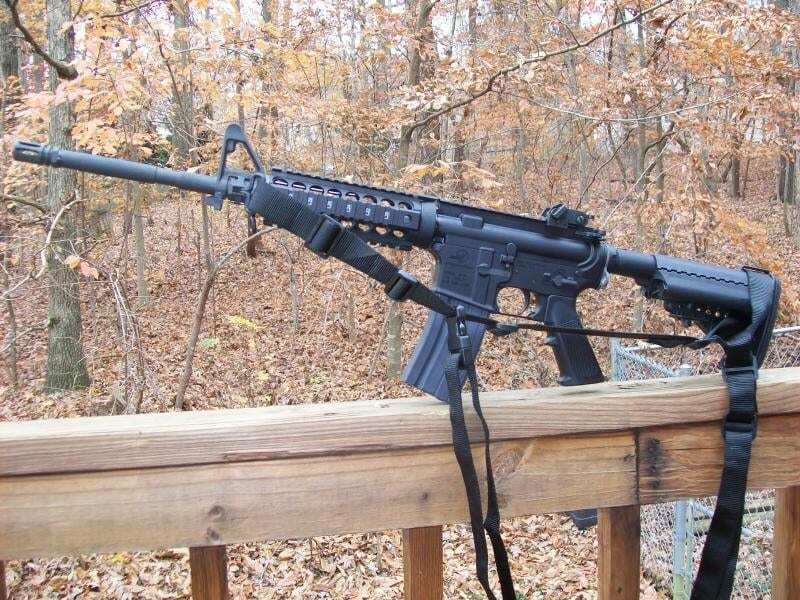 Fortunately, the AR is nothing if not flexible. One common feature of great 6.8 SPC uppers is a forward assist. This is a plunger on the right side of the rifle used to force stuck rounds into the chamber. This has been a default feature on most ARs for a few decades, but opting out is an option if you want to save weight. The same can be said of a dust cover, although we'd strongly advise having one to maintain the reliability and longevity of your receiver. The benefit of getting an upper without a dust cover is that it gives you the option of separately choosing exactly which dust cover you want. Modern uppers generally come with nothing but a Picatinny rail on top. No carrying handle and no sights. Carrying handles went the way of the flintlock long ago. Sights are such a matter of personal taste that including them with an upper would almost be an insult. Finally, you want an upper construct of milled or forged aluminum finished or coated for durability. M4-type feed ramps are ideal, but only if the barrel extension you choose also has them. These feed ramps help the 6.8 SPC caliber feed without problems. Below we outline two of the best 6.8 SPC uppers available today. Both are stripped-down, which means you are free to choose the best barrel, charging handle, bolt carrier group, and other components. This is a very reliable, no-nonsense upper, machined from 7075-T6 forged aluminum and anodized black. Without a forward assist, this upper has a classic, sleek look, saves a bit of weight, and cuts down on moving parts that could fail. M4 feed ramps cut down on the need for a forward assist, particularly if you don't expect to be using your rifle in a prolonged, life-or-death gunfight. This upper has been precision-machined to mil-spec M4 standards. This ensures the broadest compatibility with other components. This is particularly relevant with the dust guard. Ensure you choose one that is also 100% mil-spec. This upper is not only compatible with 6.8 SPC, but with eight other calibers as well. The Picatinny rail has laser-engraved T-marks to ensure you re-attach your sights or other components in exactly the same position. This is key to maintaining accuracy. This is an extremely popular 6.8 SPC upper which enjoys an impeccable level of customer satisfaction. If weight or a slick, classic look are high priorities, you can't go wrong with this upper. It has a lifetime warranty and features unsurpassed compatibility with other components and other calibers. This makes the Aero Precision is a great base on which to experiment with other component options. You can always use it for your next AR build, maybe in another caliber, if at some point down the road you decide to switch to another upper for your rifle. With all the little details looked after, however, including the M4 feed ramps and the T-marks on the rail, why would you need to upgrade? This upper is also forged from 7075 aluminum and hard-coat anodized. Everything about this upper from the milling to the anodization meets mil-spec. The interior bore even includes a mil-spec dry film lube to reduce wear. The Picatinny rail includes T-marks to ensure sights and other components are remounted in the correct places. Inside, you'll find M4 feed ramps which can make a big difference in feeding. 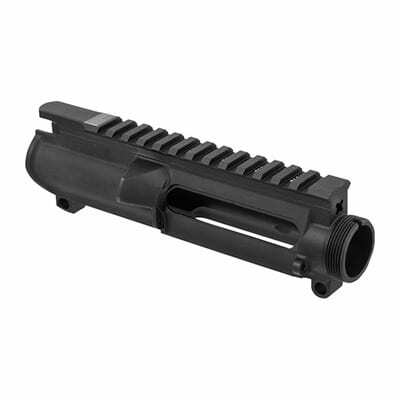 This upper is compatible with five different calibers, including the 6.8 SPC. Unlike the Aero Precision, this upper comes pre-assembled with a forward assist and dust cover. The forward assist pawl (the plunger or button) is built of heat-treated tool steel. One thing to watch out for is that the dimensions of the socket where the barrel extension fits are made to the tightest possible tolerances. This is a design feature which ensures greater accuracy. Some users have failed to fit their barrel in and blamed the upper. In fact, all they had to do was warm up the aluminum with a hairdryer for temporary expansion. This 6.8 SPC offers some of the most scrupulous mil-spec adherence you can find. This ensures compatibility with the great majority of other AR components. With the lifetime warranty, you can't go wrong. The M4 feed ramps are an important feature with the 6.8 particularly, helping it feed reliably. Top of the line mil-spec finishes, both inside and out, help make this one of the most reliable uppers money can buy. Don't be alarmed if fitting the barrel is a challenge. Don't lap or file anything, just apply a bit of heat to the aluminum. You'll appreciate the accuracy that the tight fit produces. Assembling a 6.8 SPC upper, or any AR platform upper is straightforward. The entire process only takes about five to ten minutes. AR multi-tools are available. These are mainly for tightening the barrel nut and the handguard cap. Simply follow these step-by-step instructions to correctly install your barrel, gas block, handguard, suppressor, charging handle, and bolt carrier group to your 6.8 SPC upper. Secure the upper in a vice. Insert the barrel into the barrel opening using enough force to get it snug. Be careful to get the alignment notch on the barrel into the groove on the upper. Thread the barrel nut on. Use a barrel nut tool to tighten the barrel nut as much as possible. Be careful to align the hole in the barrel nut with the hole in the upper to accommodate the gas tube. Slip your gas block tube through the hole in the barrel nut while aligning the block to the gas hole on the barrel. The gas block is secured to the barrel with a number of screws. Loctite is recommended. The handguard (or forend grip) goes over the barrel and threads onto the barrel nut. Once the handguard is on as tight as possible and properly aligned with the top of the upper, tighten the tension nut to hold it in place. Two anti-rotation screws, one on each side, also help hold it in place. Use a special AR tool to tighten the handguard cap. Thread your flash suppressor on, making sure that no slit faces directly downward. 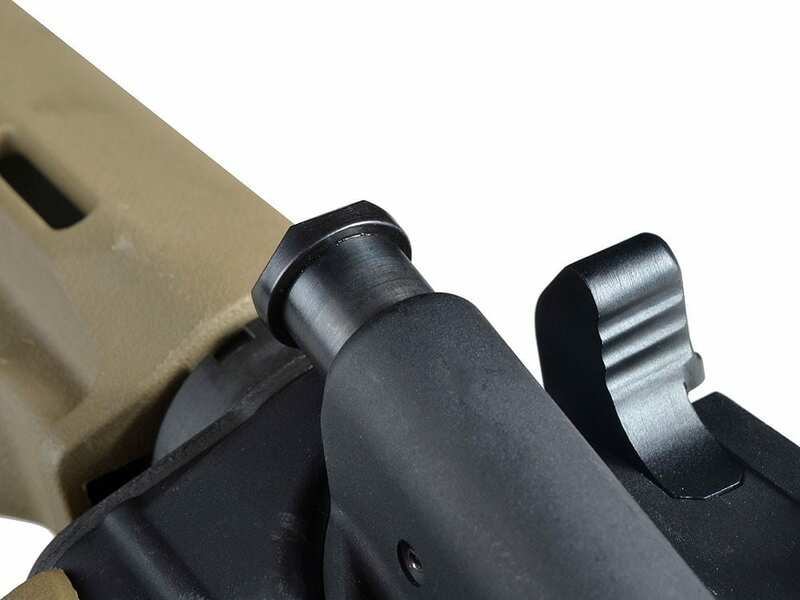 Place your charging handle into the hole in the back of the upper where the bolt goes. You will feel a place on top of the opening made to fit the wings on the charging handle into. Slip it in and it will slide into place. 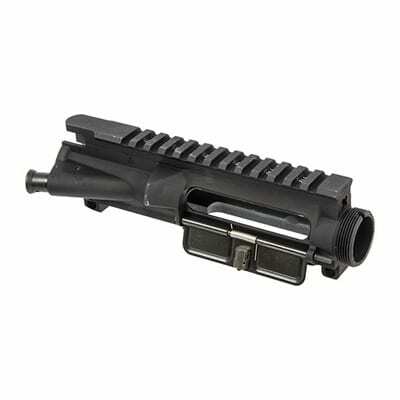 Extend the bolt from the bolt carrier group, it will not slide into the receiver otherwise. Fit the gas key on the carrier group into the underside of the charging handle and simply drop the bolt carrier group into the upper. The steps above give you an outline of the quick and easy process of assembling your 6.8 SCP upper. However, assembling components based on text instructions alone isn’t always completely straightforward. Make sure you have the components and the tools listed above, and then check the video below for a demonstration of how to install a 6.8 SPC upper. The short video is clear and easy to follow. Note that the flash suppressor isn’t an essential component. The installation of the charging handle and the bolt carrier group are not covered in the video but are relatively straightforward. If you want an AR with more stopping power than the 5.56mm, the 6.8 SPC is a great way to go. Both of these uppers are great options to build your 6.8 rifle on. The Aero Performance is a bit sleeker, more classic, and lighter weight. The Bravo Company is full-featured and offers the durability of being rigorously mil-spec. Building your own 6.8 SPC is a great way to create the perfect gun for you and pick up some knowledge and skills along the way.